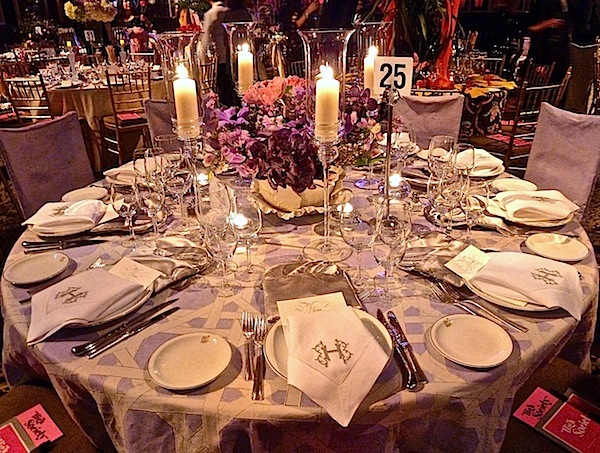 I had the pleasure of attending the Lenox Hill Neighborhood House gala last week and it was spectacular. 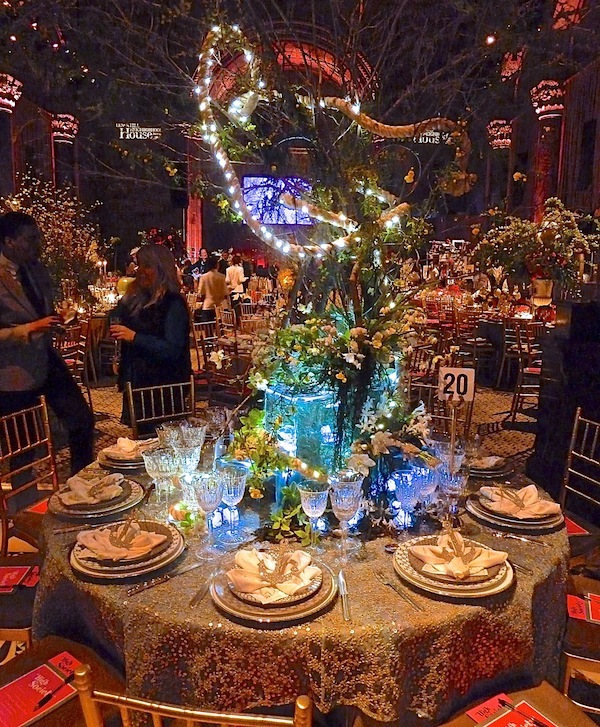 Each year, designers continue to amaze us with their tabletop designs. 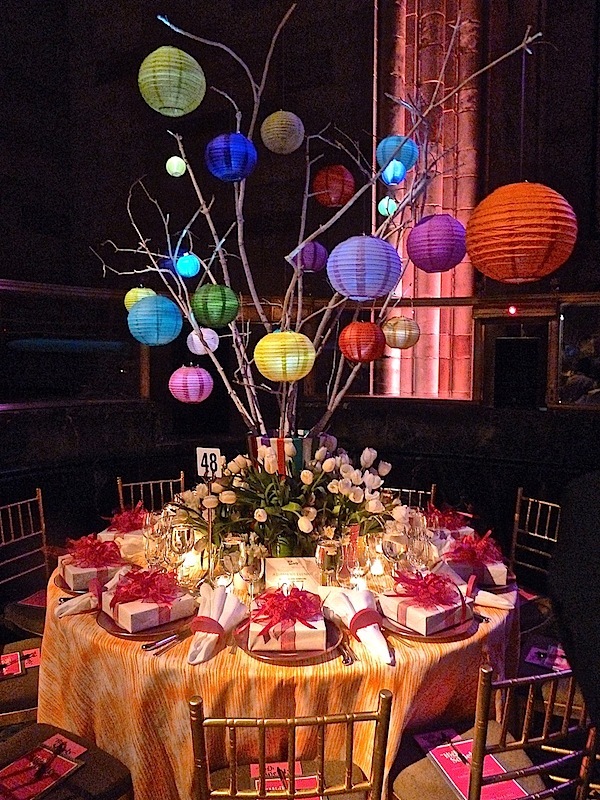 STARK sponsored the table pictured above that was decorated by the talented up-and-comer Jon Call. 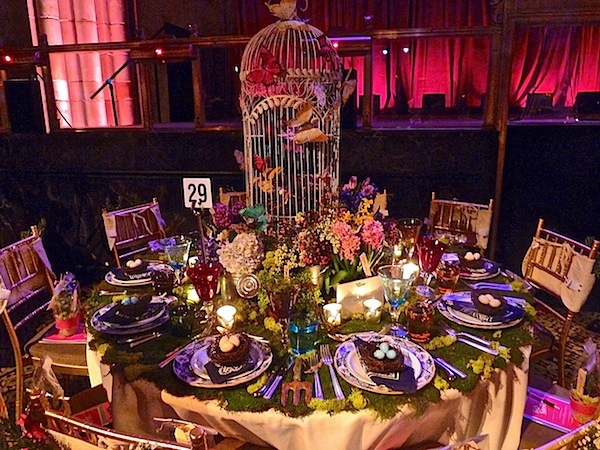 Below is a blog post I adapted from one of my favorite design blogs, Quintessence, that summarizes the evening with great editorial and pictures. Enjoy the read! 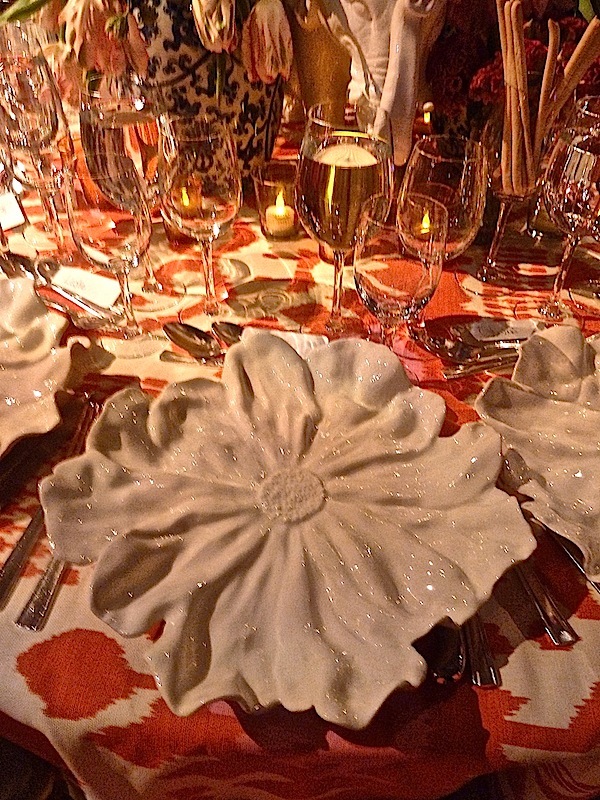 The Lenox Hill Neighborhood House tabletop event is one of my very favorites. 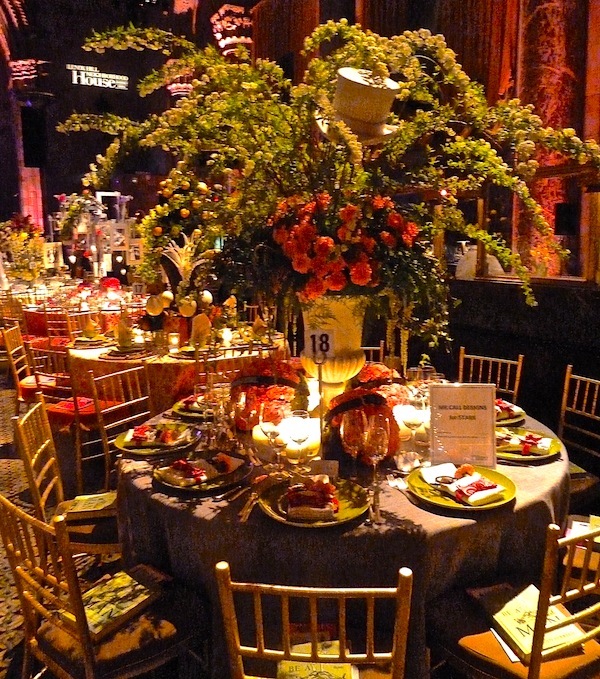 Benefitting this well respected and worthy organization, their spring gala is a much anticipated evenings. Held again at Cipriani 42nd St., this year honored long time board members Caroline and Thompson Dean for their leadership and support. Media sponsor Veranda magazine, with Design Chairs Veranda editor in chief Dara Caponigro and design and decoration editor Carolyn Englefield, antiques dealer David Duncan, interior designer Lindsey Coral Harper, and ceramic artist Christopher Spitzmiller, presented 45 stunning tables created by designers with High Society as the theme. It was interesting how everyone interpreted this year’s High Society theme. Some, like Allison Hennessy, watched the Grace Kelly movie for inspiration. 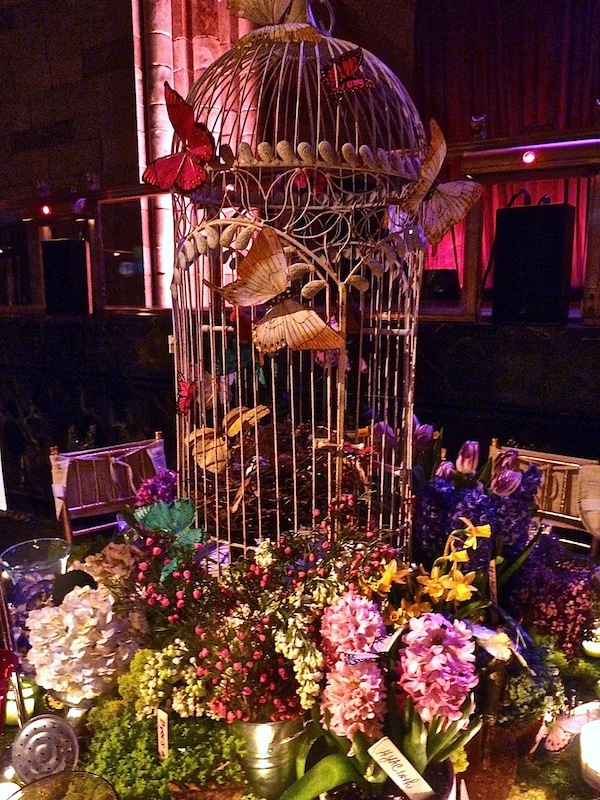 Allison’s mother-in-law, Paula Hennessy, had recently purchased the vintage birdcage at Scott Antique Markets in Atlanta. Allison had it shipped to Jim at Very Special Flowers in NYC, who filled it with an ethereal mix of greens and flowers as well as layered surrounding florals. 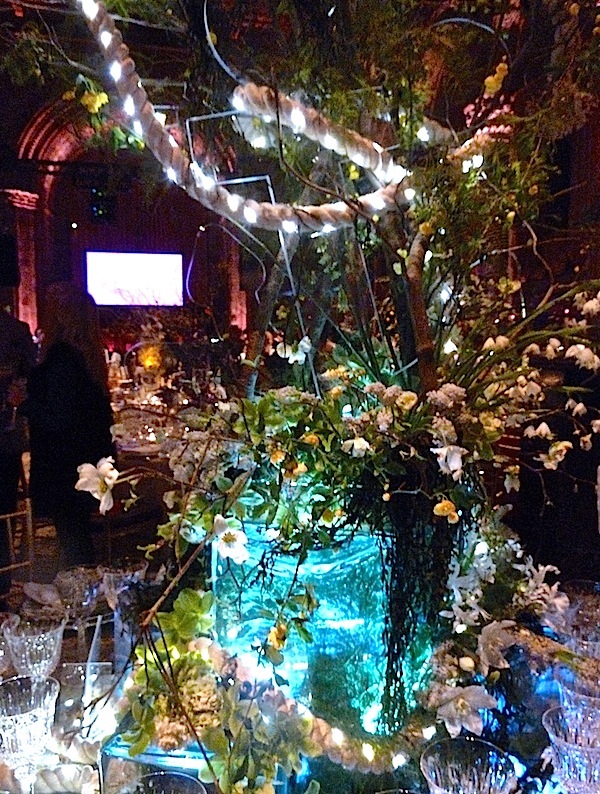 It provided both height and the perfect garden theme accoutrement. Vintage silver candlesticks (via Ebay), silver napkin rings and grey Greek key napkins from Patricia Spratt all contributed to the 1950′s Main Line vibe. 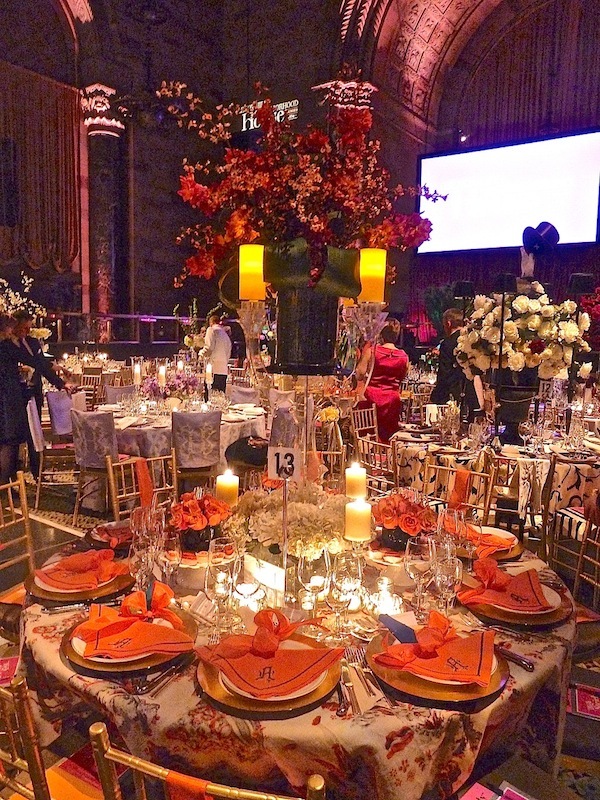 Although Thomas Burak Interiors‘ and Michael Devine‘s table was called A Luminous Evening, it could, as Michael suggested, as easily have been named In Living Color. 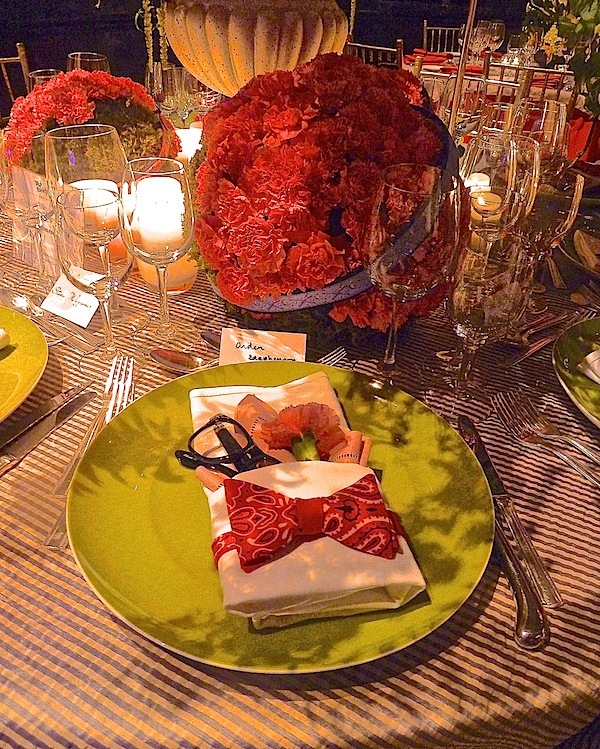 A “vivid ode to summer brights,” it included a wonderfully festive centerpiece that is an entertaining idea I’m going to have to remember! The tablecloth is Thomas (in my favorite colorway – tangerine) from Michael’s new collection that I first saw at Deco Off in Paris. Haviland service plates from Mottahedeh and fun vintage Vera wooden napkin rings (that still had the original tags on) completed the picture. 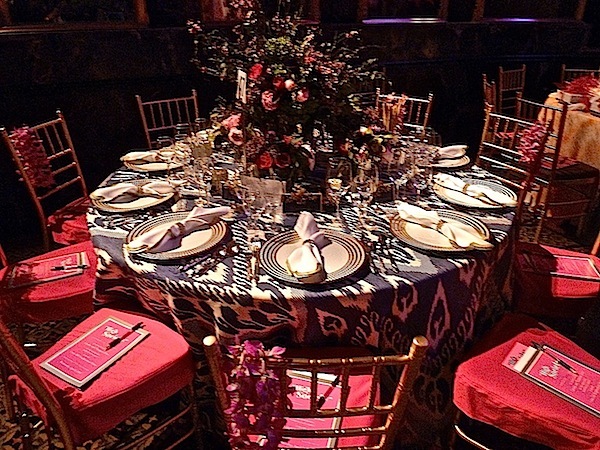 Jane Scott Hodges’ table, “Cabana 15,” for her company, Leontine Linens, showcased the beautiful linens and embroidery for which they are known. 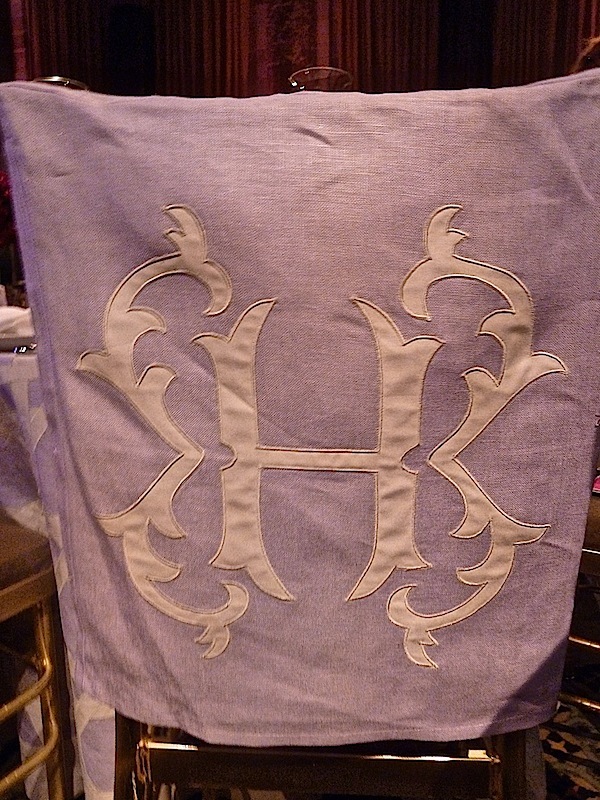 Celebrating 15 years of offering glorious linens for the home, the lovely lavender tablecloth featured an appliqué cane pattern, from their own workshops that create all of their custom-made products. What an elegant cabana with flowers by Zeze, calligraphy menu cards from Bernard Maisner, elegant embroidered hemstitch napkins (“H” for High Society) and of course an enviable gift from Leontine Linens – a luxurious satin eye mask with trapunto-quilted lash motif in matching case! 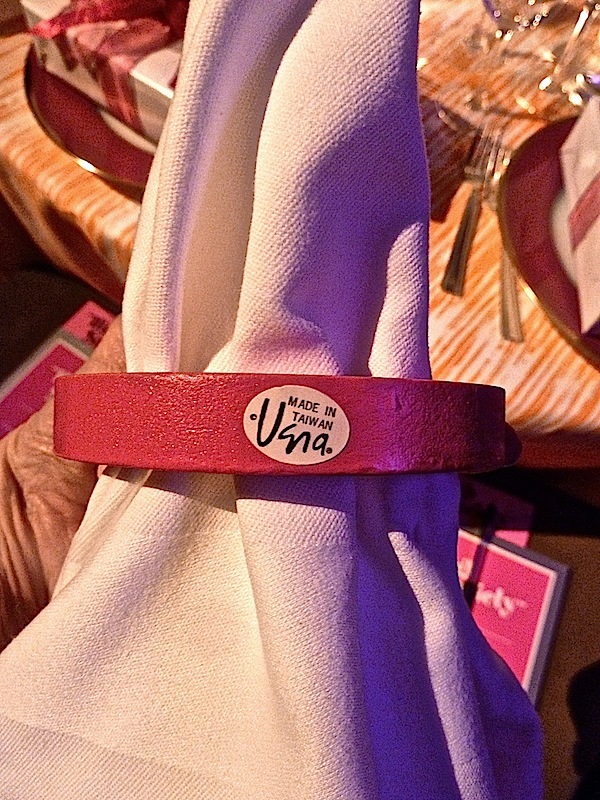 Even the back of the chairs received customized treatment! 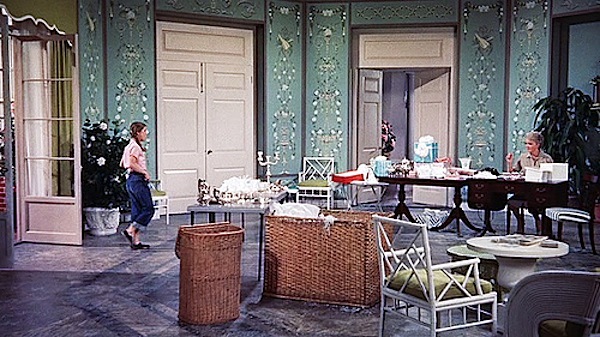 Arden Stephenson‘s table “Let Them Eat Cake” was a modern ode to the theme. 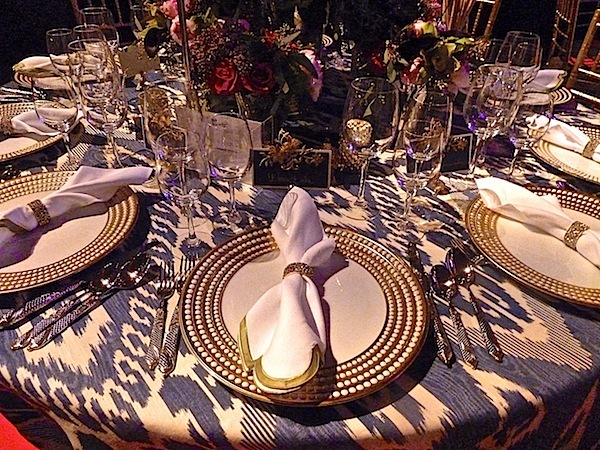 The playful Dominique Piquier Palais Royal fabric from Studio Four was a perfect pick for a “High Society” tablecloth. 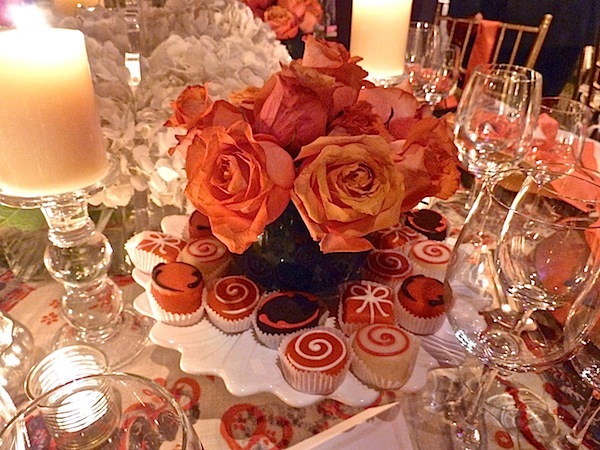 and delicious (I can personally attest to that) and beautiful custom colored petit fours! 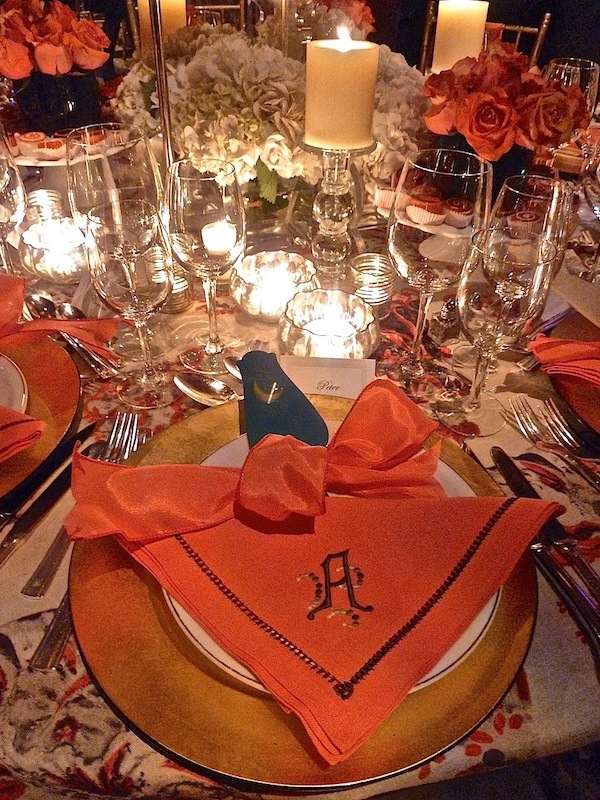 Sam Allen’s “Bollywood Nights” table was a marvelous mix of color and texture. 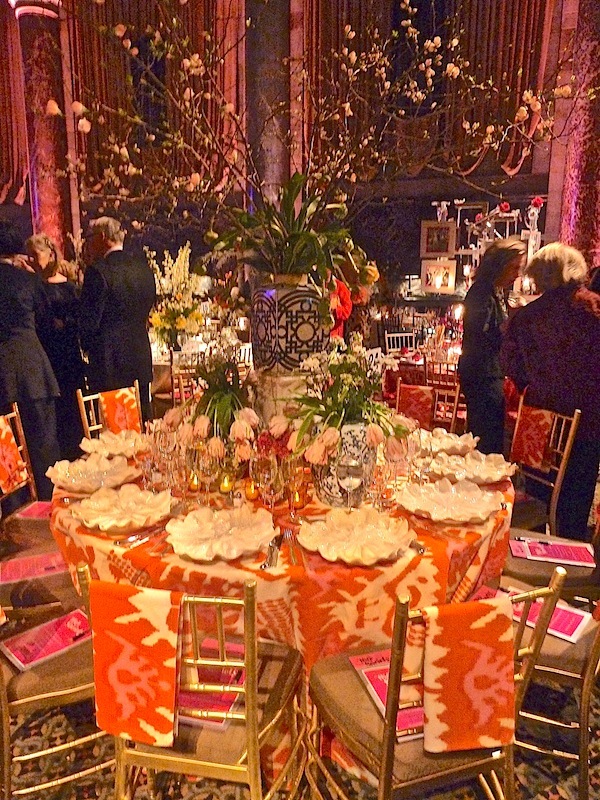 The colorfulQuadrille Kazak on the tablecloth reminded me that I don’t mind pink when tempered with orange! And now I can’t wait to get some quince branches of my own to officially welcome spring into the house. 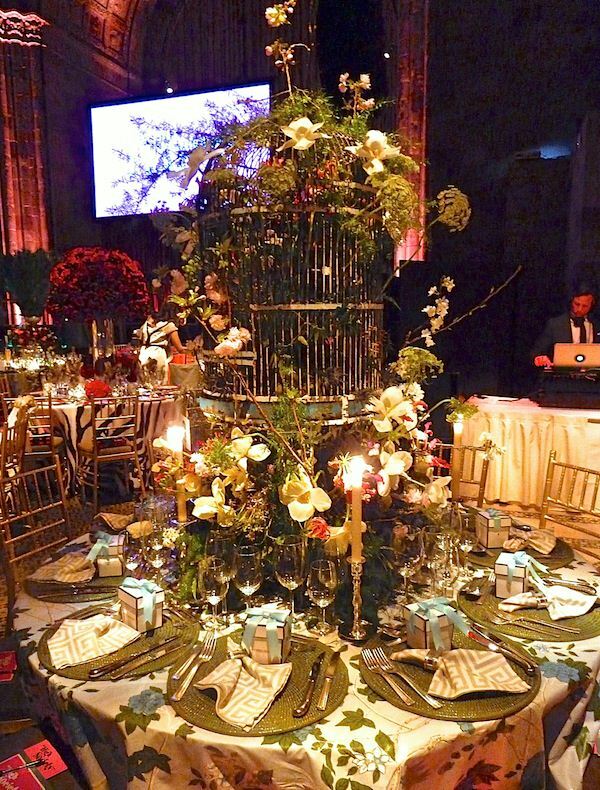 The flowers were styled by Sam’s mother, designer Leslie Allen. I love everything produced through the collaboration between Clare Potter and Christopher Spitzmiller, including these fantastic plates, available through Mallett. Nicole Gibbons’ first showing at Lenox Hill was an auspicious one! 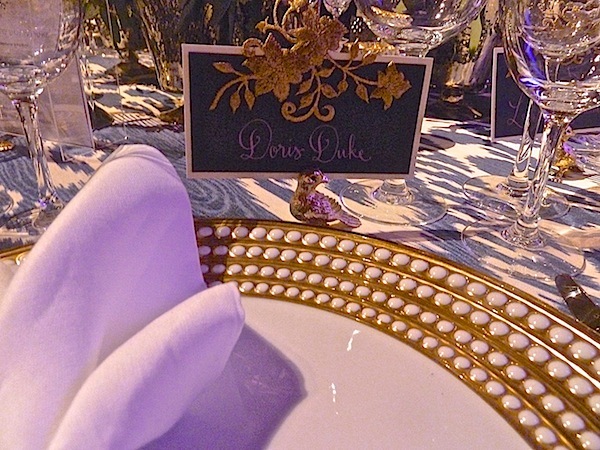 Choosing the iconic style maven Doris Duke and her Hawaiian estate Shangri La as her inspiration, Nicole created an eclectic table emulating Duke’s love of exotic design. Starting with a pretty blue ikat from Calico Corners for the tablecloth, she layered Perlee chargers and decorative objects from l’Objet and Matouk napkins. Friend Kathryn Murray did the charming calligraphy for her fantasy guests’ place cards. You can read more about the details of Nicole’s table on her blog. 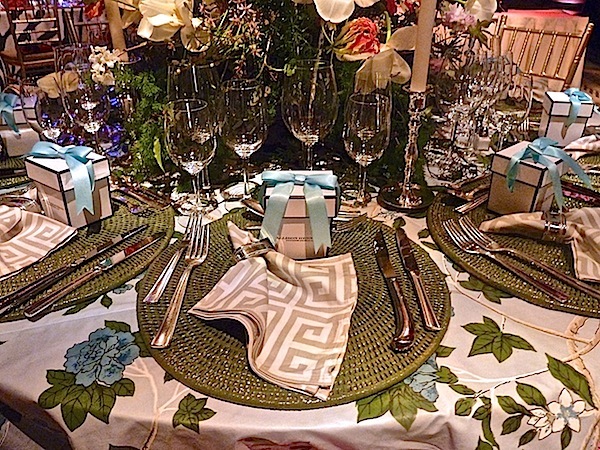 Dolores Suarez and Caroline Grant of Dekar Designs’ table was the charming “Garden of Weedin.’” A naturalistic take on an English garden, they cleverly crafted a tablecloth of moss, adding potted flowers, garden tools, silk birds and butterflies to emulate an outdoor garden party. 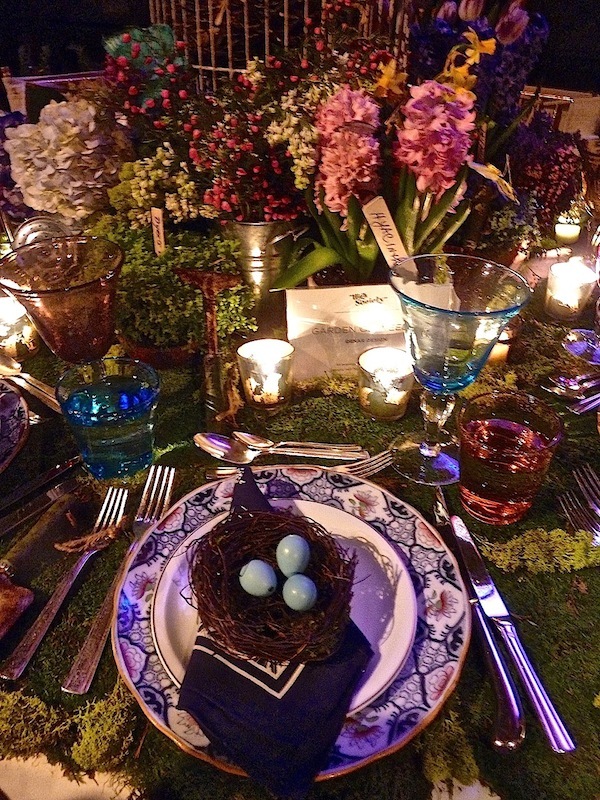 and a mini nest with (faux) robin’s eggs adorned the placesettings. 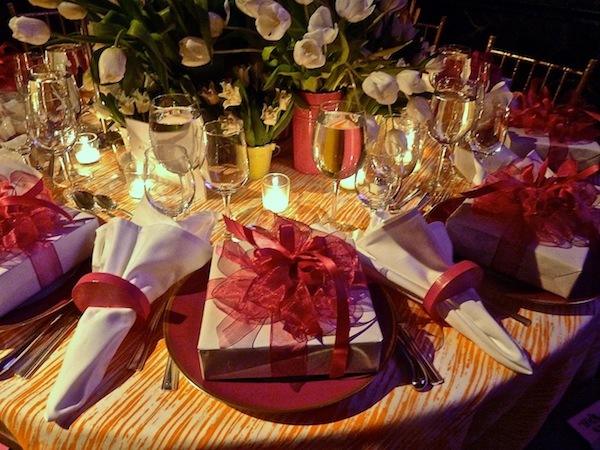 The exuberant floral arrangements were by Adore Floral and how adorable were the gifts folded neatly into a napkin package! but it was an energetic and eclectic mix of plexi anchor, nautical rope, mini lights and flora artistry by Emily Thompson. 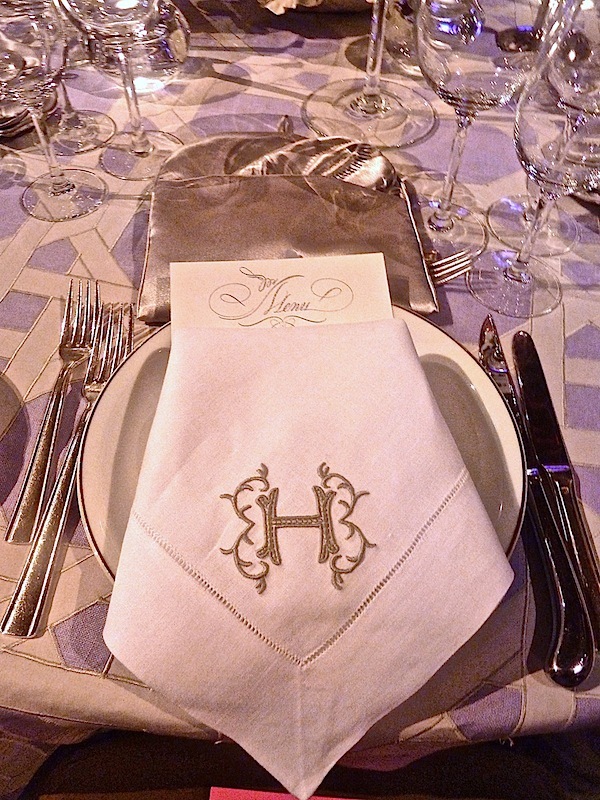 Harry was lucky enough to work with the Hermès group and featured the handsome Hermès Fil d’Argent plates, Puiforcat cercle d’argent silver presentation plates and Chantaco flatware andSaint-Louis Tommy glassware. 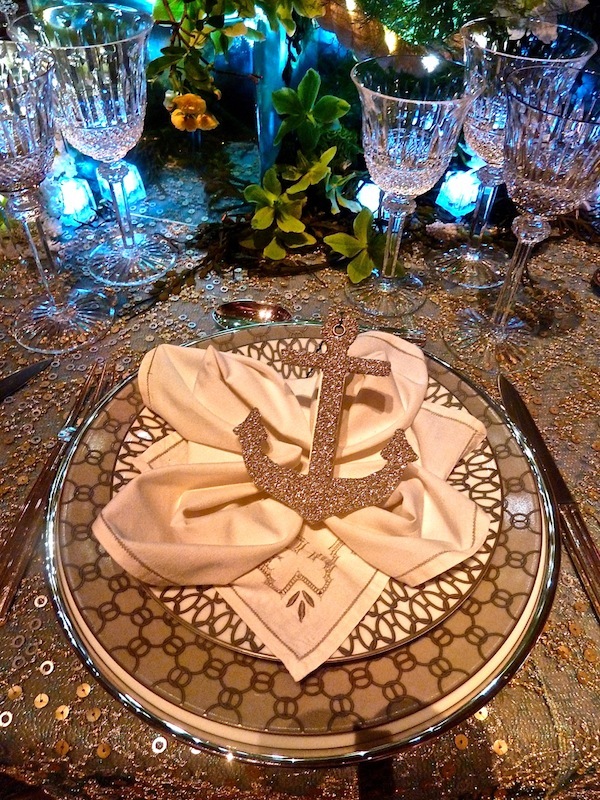 They all looked fabulous set on a sparkling sequin and paillette tablecloth. While I may not have been able to feature all 45 tables, please know that they were all creative, beautiful and contributed to the enormous success of the evening!